1) Assume firms in an industry break even. New investors ________ attracted to the industry and current ones ________ running away from it. A) earning zero economic profits. B) earning less than a normal rate of return. C) shutting down in the short run. 3) Firms earning a profit will want to ________ their profits in the short run while firms suffering losses will want to ________ their losses. A)all firms that earn a loss will shut down. B)if current firms are earning a profit, new firms will enter the industry. C)firms act such that they minimize losses or maximize profits. D)All of the above are correct. Refer to the information provided below in Figure 9.1 to answer the questions that follow. 25) Refer to Figure 9.1. This farmer maximizes profits by producing ________ bushels of wheat. D) indeterminate unless we know the level of output the firm is producing. Refer to the information provided in Figure 9.7 below to answer the questions that follow. 35) Refer to Figure 9.7. In which of the following price ranges will the firm continue to operate but at a loss? 37)Refer to Figure 9.7. Suppose demand for wheat is initially D2. If consumer incomes increase, then demand for wheat will shift to ________. This will ________ the equilibrium price of wheat and individual profit maximizing firms will produce ________ bushels of wheat. 38)Refer to Figure 9.7. Suppose demand for wheat is initially D2. If the price of rice (a substitute for wheat) falls, then demand for wheat will shift to ________. This will ________ the equilibrium price of wheat and individual profit maximizing firms will produce ________ bushels of wheat. 39) Refer to Figure 9.7. If demand for wheat is D2, then a profit maximizing firm will produce ________ units and earn a profit of ________. 40)Refer to Figure 9.7. If demand for wheat is D3, then a profit maximizing firm will produce ________ units and earn ________. A) the firm will shut down. B) the firm will exit the industry. C) new firms will enter the industry and the current firms will expand production. 42)Refer to Figure 9.7. 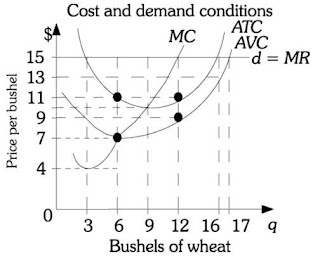 If demand for wheat is D1, then a profit maximizing firm will produce ________ units and earn ________. A) the firm will increase its price and output. D) firms will increase their output so that their average fixed cost per unit falls. A) revenues exceed variable costs of production. B) revenues equal fixed costs. C) price is less than average variable costs of production. D) price equals marginal cost. A) price exceeds average variable cost but is less than average total cost. B) price exceeds marginal cost. C) revenues are smaller than total variable costs of production. D) revenues are greater than total variable costs of production but less than total costs. A) resources are allocated among firms efficiently. B) final products are distributed among households efficiently. C) the system produces the goods and services consumers want. 22)Which assumption leads to an efficient allocation of resources among firms? A) Factor markets are open and competitive. B) All firms pay the same prices for identical inputs. C) Firms behave so as to maximize their profits. 26) In perfect competition, ________ is the condition that ensures that firms produce the right things.